I’m probably not the only blogger who keeps a pad on my desk where I jot down blog ideas. Sometimes the idea is complete in my mind and I just need to take a few pictures and sometimes I need to chew on it for a bit to decide how I want to present my ideas. One idea that I’ve been chewing on for quite a while has to do with taking pictures. Whenever I see a picture of a beautiful person in traditional costume or engaged in a religious rite or the riding a donkey like the boy in the picture above I often think about how they feel about having their picture taken. To all the “real” photographers out there – do you ask? If you do, does it spoil the moment? What about if you aren’t fluent in Spanish? 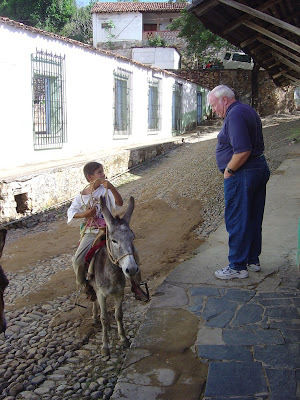 The picture below is the original picture (with permission from Lee in Mazatlan) and I love seeing that her late husband was talking to the young boy on the donkey. Makes me feel a lot different than the first photo did. Back at Christmas-time there was a small procession from one of the smaller churches to the cathedral. A priest, a couple of altar boys with banners and about a dozen parishoners were walking along a side street and we happened to see them while we were out walking the dogs. I actually felt like I shouldn’t even look since it was a private thing for them…..and then I saw a tourist clicking his camera – and for some reason it made me mad. When I was composing my post about our car wash friend Cuauhtémoc – I really wanted a picture of him not posing for a picture but I just couldn’t bring myself to go into stealth mode. And of course once I asked him if I could take his picture he had to put down his rags and wave at me. And then came my post on the visible underwear. I honestly saw so many women with horrible underwear that would have been fun to go along with that post, but I just couldn’t grab the camera and click. Today I read Jillian’s post at Dropped In about the Handsome Senora – and at the end she says she is still too shy to ask to take her picture. I can totally understand. But Jillian painted a picture for me so I truly can see her in my mind. I would love to hear how you feel about taking pictures, especially of people wearing traditional dress or participating in religious ceremonies. You pose a very good question. I used to be a mystery shopper, and it was my job to get photo documentation of a store and its employees without their knowledge, so I think I am a little more comfortable with just snapping pictures. If people are participating in any sort of public event, I think it’s perfectly okay to snap away. And to me, that includes the spectators. Some of my favorite pictures I have are of people watching parades. Similarly, if people are out in a public space, I think its okay to take pictures. Last Christmas, a lot of local families gathered in one of the plazas in the afternoon to show off their gifts. Everyone was wearing their new clothes and carrying their new toys – bikes and scooters for the kids, cameras and video recorders for the adults. I took a lot of pictures and everyone preened for the camera. If people are just going about their daily lives, then they have a right to privacy. Sometimes, though, I see someone who just captures me, and I will take their picture. After I have done so, I will approach them, show the the picture, and ask if its okay to keep it. If I plan on publishing it, I let them know. If it is okay with them, great. If its not, I will delete it there in front of them. That’s one of the great things about digital cameras. So far, most people have been very flattered that I was moved to take their picture, and many have asked where they will be able to see it online. I miss a lot of good pictures, just because I don’t feel “right” about taking them. When I took some of a small Virgen de Guadalupe procession, I approached and asked if it was alright to take photos and they all smiled and said yes. I think most of the time it is my own inhibitions that restrict me, I am shy and don’t like to stand out in the crowd as that weird “tourist” who is always taking pictures of something. Thanks for the shout-out Nancy. For me too it is an on-going dilemma. When I try to be stealthy the pictures turn out blurry or missing the key feature – beautiful or unusual or whatever was happening in the moment. When I am emboldened to snap a shot of an interesting person I feel like a prying tourist, anxious to show off how “exotic” it is here. I probably way over think it, as always. When I do ask, the person always obliges, so why do I feel silly? Good to know I’m not alone! A very good question indeed. I agree that if it is a public event, that I feel freer to snap away. Beach shots I can take surreptitiously but never of kids unless parents give permission. I am still a bit shy about asking to take pictures, but when I do I explain that I am a photographer working on a project, not just some tourist. Most people have been more than happy to give permission. If it is someone who really looks like they could use it, I will “tip” them as well, give them 10 or 20 pesos for the “right” to use their photo. Wayne, John, and I have had some discussions on this topic. John has some great techniques in catching people in candid moments. Creative cropping is always a great technique. But all of you have touched on the most difficult issue — how it feels. Too often, I overlay my privacy concerns where none may exist. I tend to take more shots now knowing that most people do not mind. The one exception was in the south of France two years ago. I kept trying to photograph a beautifully dressed young woman, but she was always one step ahead. I thought I had found the perfect spot to photograph her — in a card shop. As I went around the end of an aisle — there she was — and she hit me with her purse. My judgment was certainly wrong on that one. Thanks, everyone. I’m glad I wasn’t the only one thinking about this, and I like some of the ideas. I know I’ll use Jennifer’s “take the picture and then show it to them and ask” idea and possible Kelly’s “tip” one, too. But I think I am more comfortable with taking pictures of things or general scenes rather than individuals at least right now. I believe in the US it is completely legal to take anyone’s picture, even without their permission. Is this also true in Mexico? As Steve mentioned, we have had a few discussions on this! Currently, my rule is if they are in the public, they are fair game. I never, ever take pictures of kids unless their parents are in the picture or I have asked the parent first. The thing I hate about asking permission is what you mentioned…you never get a candid photo of the real person. They always have to pose. I’ve used Canuck’s approach also, lying through my teeth about some project or the other. Usually these are the snarky photos and I just have to have a shot of how ridiculous this person looks! This blogging business is fraught with unanswered questions you never drempt of when first starting out! Nancy – One option is to get them in front of a nice building, and you can always say you were shooting the building if they take offense! Hee hee! When people are all dressed up in traditional costume, I think they probably LOVE having their photo taken, and may even ask for a print. Especially if their kids are in it. But no, I don’t want them to pose either. And the same goes for religious events: I think they like the idea of it being “immortalized” by your camera. Older women are the ones you have to watch out for, many of them get really miffed when you take their portraits. Andee had that problem a few times. If you get a nice one, and there’s time, you might show your subject the shot, and say “See how nice you look?” in Spanish. I will not add to debate. I just wanted to tell you I really like the picture of child on Donkey. I love to take pics and will be buying new camera this week. I too am going to need to decide boundaries. I have been thinking about this issue for a while as well now, since I have this secret dream of being a street photographer 🙂 I think if you have an official looking camera, you can tell people you’re a photographer and they’ll take you more seriously than someone with a small cheap camera that looks touristy. I’ve also heard that when “your subject” looks at you, you can just smile and kind of nod pointing at the camera as in asking “is it ok?” and I guess this usually works pretty well. Less “westernized” people usually don’t pull out a cheesy smile either, they’ll often keep going along their business. Another technique is looking at something behind the person you’re trying to photograph, as if that’s what you’re taking the picture of, and then when you look through the camera, actually take a picture of them. This has been very helpful for me 🙂 Because people instantly don’t care since they think you’re not interested in them. I do get the feeling you get though, especially if you want a picture of people that are not as well off as homeless people and such, it makes me feel bad.